I knit Nilgiri this summer, both at home and in Halifax! The sleeves were perfect travel knitting – easy but not boring, and small enough (since I didn’t want to pack the whole sweater!). I picked up this Indigodragonfly MCN Worsted last winter or so at work. It looks like more of a red until you take a closer look and realize it’s more of a saturated, deep hot pick. I love it! It was super squishy to knit with and has awesome stitch definition. The stitch pattern is one that I made up myself. I do use stitch dictionaries sometimes, at least for inspiration, when starting a new sweater design, but for this one I pretty much started from scratch. I was inspired by some runway and ready-to-wear sweaters and jackets with geometric, square designs in colours and textures. 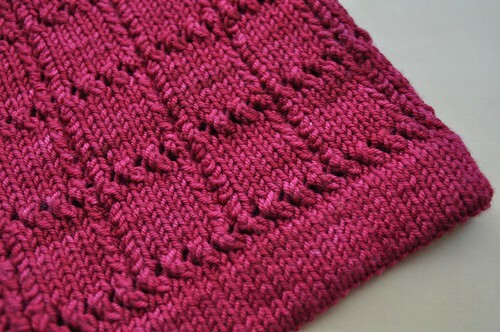 I wanted to figure out a stitch pattern that looked like squares, but a little more interesting to knit than your standard knit and purl basketweave type. 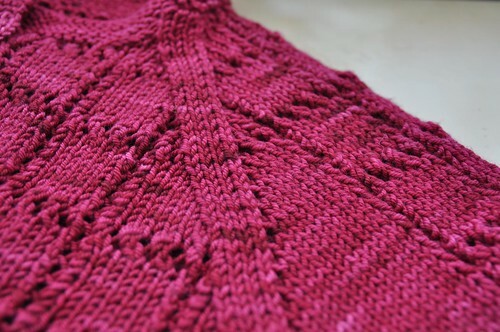 I love knit-in hems and this was a great project to do them on – they don’t distract from the geometric pattern, and create a nice clean edge. The sleeves are knit flat because it was easier to work the cuff hem, as well as making the Lacy Squares pattern the same on the sleeves and body (which is also knit flat). But you still join the sleeves to the body for the yoke as for other bottom-up raglans, so although it isn’t completely seamless, the sleeve seams are easy to do! I found some cool square wooden buttons in my stash, although (shhh) they’re a little too small for the buttonholes and keep popping out! I’ll have to get some new ones if I want to wear it buttoned up. To purchase the pattern, check out Afternoon Tea Volume Two or Nilgiri on Ravelry. Beautiful sweater! 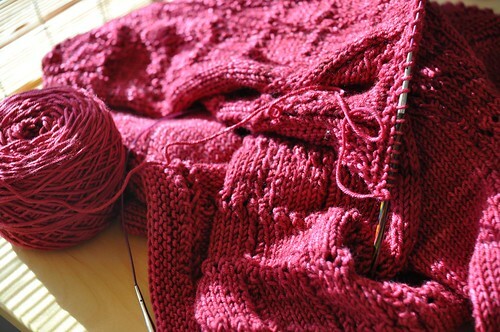 If I ever finish the darn sweater I am knitting for my husband I am DEFINITELY casting on something for me. Keep up the good work! And yes, your model looks gorgeous! You’re sweaters are beautiful. Such a talented designer!